I've been up in Alaska several times and have seen Black-legged Kittiwakes quite often. However, these guys are another story! Much rarer, and only breeding in a few remote islands that few of us will ever see. This lone photo is from the Alaska SeaLife Center in Seward, Alaska, a wonderful place to visit if you get a chance. Click on the thumbnail for high-resolution photos. 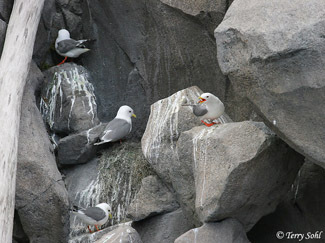 Click here for the species description page for the Red-legged Kittiwake.